68% of Americans have smartphones, 45% have tablet computers, other devices not growing | What's The Big Data? 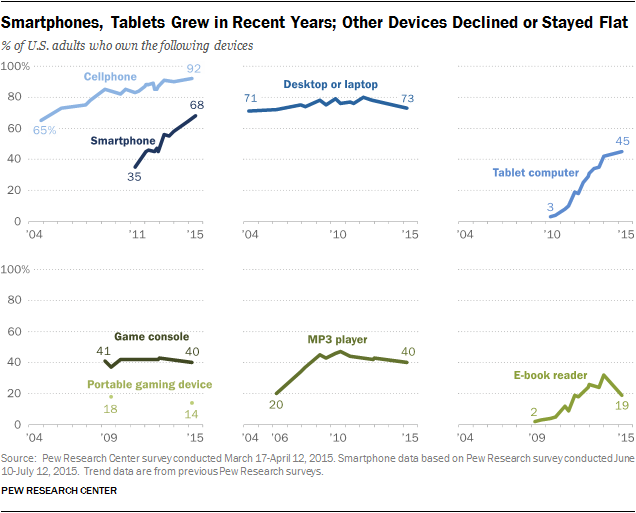 Today, 68% of U.S. adults have a smartphone, up from 35% in 2011, and tablet computer ownership has edged up to 45% among adults, according to newly released survey data from the Pew Research Center. Smartphone ownership is nearing the saturation point with some groups: 86% of those ages 18-29 have a smartphone, as do 83% of those ages 30-49 and 87% of those living in households earning $75,000 and up annually. This entry was posted in Mobile and tagged ebook reader, Smartphone, tablet. Bookmark the permalink.